Rendez-Vous ballpoint pen is part of one of the earliest Limited Editions made by S.T. Dupont: Rendez-Vous. 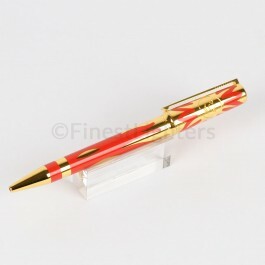 The pen is finished in yellow gold and authentic red Chinese lacquer to symbolize the sun. Only 2000 individually numbered pieces were made in the far 1996 (very rare).